When I attempted to identify UK’s digital leaders, I analysed companies based on their Profitability and Revenue Efficiency. The latter is an often overlooked element of digital transformation that effects the customer experience, operations and business model development. For instance a business that generates £1m in sales from 10 employees is more efficient than the business that does £10m from a 1,000 employees. It’s really a question of scaling. 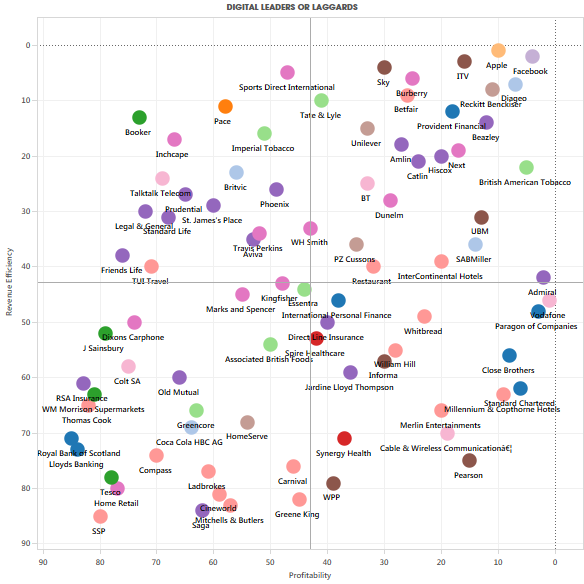 US tech giants Apple, Google, Microsoft and Facebook were the leaders in my analysis. The best of the four was Apple, which manages to generate an incredible 18% ROA and close to $2m in revenue per employee! Other non-tech giant companies that fared well were ITV, IG, Sky and EasyJet. Also there was a general strong performance from builders and property investment companies. Truthfully I think that true market leading revenue efficiency comes from more that just the clever use of new technology. It’s about brand, product, marketing, pricing, competitive forces and operation excellence. Uber runs a taxi service but has managed to cut the cost of running a call office to book cabs. By completely digitising the connection between the passenger and the driver they have stripped out a cost and given themselves the ability to rapidly scale into new territories. Providing that you create mobile and web digital experiences that are optimised for the customer, you can sell more with centralised scaling resources. Increase business efficiency by replacing broken processes with new digital solutions to reduce errors and improve the speed of operations. Again this is a challenge of scaling a business effectively. A CEO I recently met would challenge his executive by constantly rephrasing questions of scale. By asking “is this the right approach if we have 100x more orders?” he could determine whether the operation would scale efficiently over time. Cloud computing also offers the ability to scale systems and infrastructure in line with customer demand. Therefore the business is buying capacity as its needed rather than after the fact. Finally, digital leaders can improve revenue efficiency by launching digital products and services. This may be an entirely new proposition (as Kindle was for Amazon), a complete market disruption (as iTunes was for the music industry) or an added service for customers (online training for purchasers of a product). These provide a way to either attract new customers or grow sales amongst existing customers. The table below ranks each business profiled by their Revenue Efficiency. Each business’ rank is a product of it ROA and RPE.